One of Malaysia most prestigious Jazz festival is back. Borneo Jazz Festival 2013 promises the exciting line up of top international bands and some of the Asia best musicians. 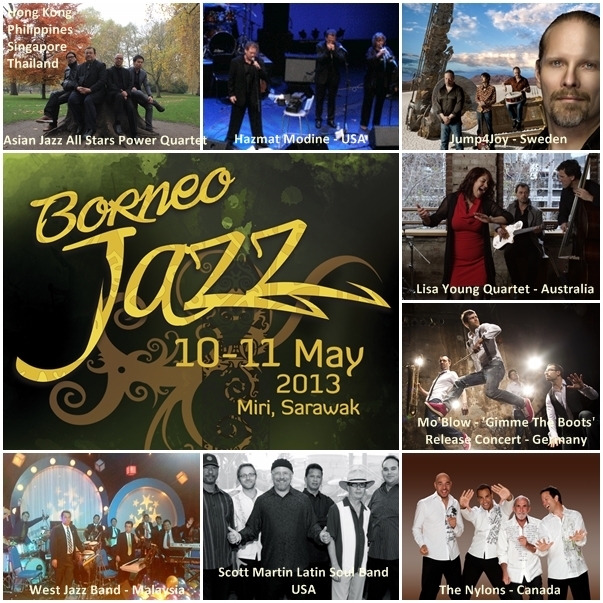 Go on an adventure in Sarawak as you groove to the music of Borneo Jazz 2013. Hornbill - 'Burung Kenyalang' in Malay or Burung Enggang in Iban is cast as the latest landmark in Damai Central, Santubong, Kuching. The statue stands at 7 meter high and the wings spanning 9 meter wide. Damai Central, just a 40 minutes drive from Kuching town, an innovative resort-styled multipurpose complex built in Sarawak ethnic-concept design. The famous Sarawak Cultural Village is just across the road to it. Bring your friends and family for an evening stroll along the Damai Beach; feel the sand between your toes while enjoying the majestic view of Mt. Santubong. After the long walk, you can head to the food court where you can find local and fusion food from 10 units of stall available at the complex. Besides the food court, the complex also offers 15 units of commercial lots which include a seafood restaurant, pubs, convenience shops and souvenir outlets. Those who want to experience and take photos with this giant Hornbill...come to Damai Central and capture memory for yourself. Borneo Jazz this year is a bit of a geographical fruit trifle. The 2013 edition will be a blend of eastern spice, western punch, smooth northern cream and southern sunshine.The jazz festival is now in its 8th year. The dates are 10th and 11th May. As usual, a Friday and Saturday of starlit music, and then the Sunday to recover. It’s going to be, as Borneo Jazz usually is, Jazz Plus Plus . Always jazz, but with tangents into the periphery relatives of perhaps funk, perhaps ethno, perhaps latin, perhaps blues. And hopefully, something quirky and unexpected. This year, we are top heavy on Northern America. We have two bands from USA – one from the East Coast and one from the West; and one from Canada. The Nylons – a legendary band with 7 gold and platinum recordings was formed in Toronto in the 1970s, changed members along the way, and still going strong with their newest CD “Skin Tight” nominated as Best Jazz Vocal Album for a JUNO Award. Claude Morrison is the only original member left and he might very possibly be still the perkiest singer in the band. Think beautiful vocal harmonies, think wonderful humour, and think feel-good songs that are going to put a smile on your face. Based in California, Scott Martin is bringing his 6 piece Latin Soul Band. Scott spent many years playing with Poncho Sanchez where they won a Grammy in the year 2000. The list of names that he has played with is like the Who’s Who of Jazz. They have played all the major jazz festivals in the world, been featured on TV talk shows. Scott’s band is still touring furiously and they have launched 7 albums. And who really can resist the hip swinging pull of exuberant latin jazz? Then right across the continent, New Yorkers Hazmat Modine presents a completely different dimension with their dirty New Orleans blues, edgy vocals, pungent brass, colours of the Carribean, Africa and Klezmer cooked together, and leader Wade Schuman will knock your socks off with his jaw-dropping virtuosity on the harmonica. Their CD “Cicada” was top of the world music charts in Europe in 2011 and also won the Charles Cros Grand Prize in France. Wade himself is an enigma – not just an incredible musician, he is also a Fine Arts lecturer, a philosopher, a painter, an ardent nature lover and an amateur zoologist. From Asia, we have the crème de la crème of musicians from Singapore, Hong Kong, Thailand and the Philippines. Jeremy Monteiro is a household name in Asia music industry and since his debut into the west at the Montreux Jazz Festival, he has been performing all over the world. He is Singapore’s King of Swing, Artistic Director for several jazz festivals, has a long list of accolades and achievements, and he comes to Borneo Jazz with the Asian Jazz All-Stars Power Quartet with amazing guitarist Eugene Pao, Tots Tolentino on saxophone and Chanutr Techatana-nan on drums. Between the four of them, they have played alongside big names like James Moody, Chick Corea, Herbie Hancock, Ernie Watts, Cassandra Wilson, Terumasa Hino, Herbie Hancock, McCoy Tyner and many many more. Representing Borneo is West Jazz Band founded by keyboardist Eugene Clifford and saxophonist Safri bin Mustapha. They will be playing a mix of fusion funk with vocalist Lisa Chong. All 7 members of the band are from Sarawak where they perform often and are recognizable faces around town. From northern Europe come two bands, both quartets, of different temperament but of similar irrepressible energy. Mo’Blow from Germany is calling their show at Borneo Jazz the “Gimme The Boots” Release Concert. Their music is sheer hard funk. They were the winners at the 2008 Berliner Jazz & Blues Award, have an album produced by Nils Landgren, and described as the hottest club band around. Their founder Felix Falk leads them into unconventional explorations in their music. Listen for spicy harmonies and quirky turns of phrases. And from Sweden, Jump4Joy brings popular and vigorous energy with their dancey entertaining high octane shows. Two of the musicians, Bo Gunnar Gustafsson and Ulf Gustaf Sandstrom have been nominated for their contributions to Swedish blues by the Scandinavian Blues Association, and Gusfatsson won the Janne Rosenqvist Memorial Prize in 2008. From Down Under comes the creative and lovely Lisa Young. She fuses and improvises with the South Indian vocal technique called konnakol. The result is unusual and extremely appealing compositions. Lisa and her Quartet won the Bells Awards for Best Australian Jazz Vocal Album and they are bringing their song cycle The Eternal Pulse to Borneo Jazz, after having premiered It to a standing ovation in 2011 at the Melbourne Jazz Festival. Lots and lots of ingredients piled into the programme – complementing, contrasting and, I’m hoping, will pull you into a vortex of intoxicating dimensions. Borneo Jazz festival is held in the cosmopolitan seaside town of Miri, north-east of Sarawak; about two hour and fifteen minutes flight time from the capital of Malaysia, Kuala Lumpur.